And before you know it, your baby’s diet grows from just one food to….. so many! Thinking about the next chapter of your little eater’s life can be…. a lot. What should I feed them? Ok, what else should I feed them? How do I know they won’t choke? How do I know they’re eating enough? How do I know they’re not eating too much? And on, and on, and on. 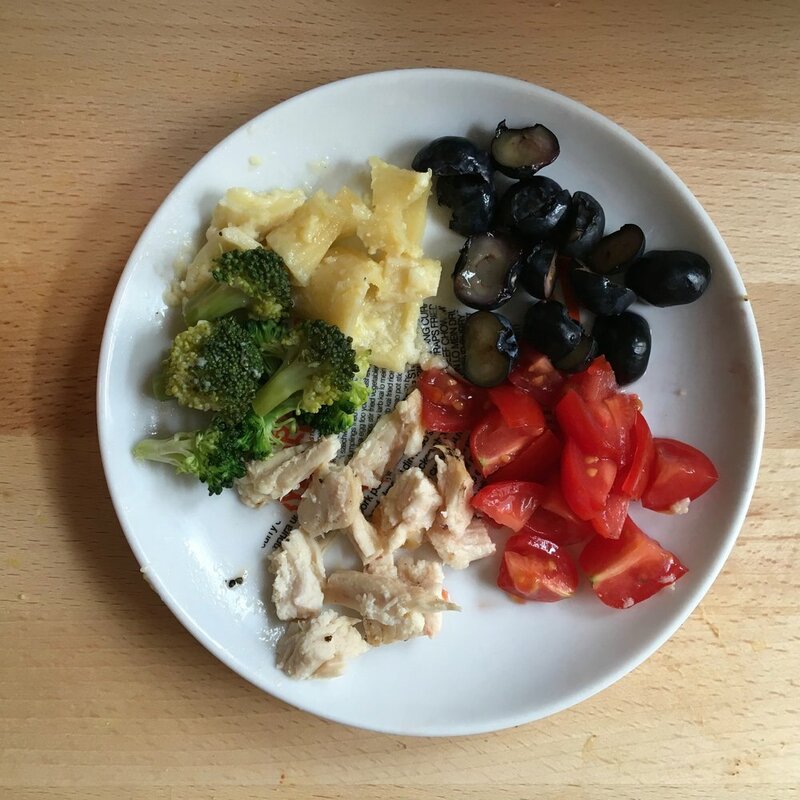 But, fortunately, many of the common fears and myths about starting babies on solids are just untrue, or designed to make you think you need to buy special foods and tools to raise a healthy eater. For the most part, your baby can eat *most* of what the rest of the family eats, provided it’s a safe size and texture. You can make your own baby food easily, with no special ‘baby food maker’. And babies are excellent at regulating their own appetites, meaning they will (for the most part) stop eating when they are full. Here are the top tips to start your baby on solid foods with ease and confidence. Get your free download of this article here to reference anytime. 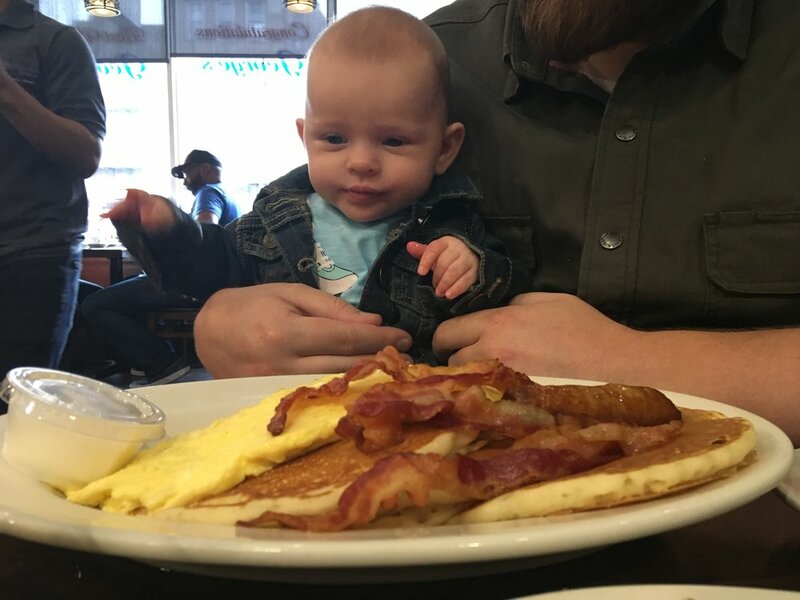 My daughter Ava, at 4 months - almost, but not quite, ready to dive into daddy’s breakfast at the local diner. The American Academy of Pediatrics recommends that most babies begin the introduction of solid foods around 4-6 months of age. Prior to 4 months of age, your baby’s digestive system is not mature enough to handle solid foods, and introducing solid foods before 4 months of age may put your baby at higher risk for developing food allergies. You should always talk to your pediatrician before introducing solid foods, and discuss any concerns you have around your baby’s weight, allergies, or other medical concerns. Babies and young children have immune systems that are still developing, so they are more prone to foodborne infections. You can help keep your baby free from these types of infections by practicing good food safety. Learn more about food safety for your baby here. Clean - wash your hands and baby’s hands prior to preparing food. Clean all surfaces used to prepare food (cutting boards, knives, bowls, etc) often. Separate - keep raw meat, poultry, fish and eggs separate from foods that are ready to eat. Do not reuse any utensils, cutting boards or other cooking tools after they have come into contact with raw meat, poultry, fish or eggs. Cook - cook meat, poultry, fish and eggs thoroughly. Do not serve raw or undercooked meat, poultry, fish or eggs to your baby. Chill - store any leftovers in the refrigerator or freezer within 2 hours of being cooked. Store - homemade baby foods can be safely stored in the refrigerator for 1 day, or in the freezer for 1-2 months. Reheat - reheat foods from the refrigerator or freezer until they are thoroughly heated, then let stand until they are cool enough to eat. Unpasteurized foods - never serve your baby unpasteurized (“raw”) milk or juice. Always supervise your baby while they are eating, and I highly recommend that all caregivers should complete an infant and child CPR class that covers choking. Babies are surprisingly excellent at regulating their own appetite. They tell us when they are hungry. They eat to fulfill their hunger. And they stop eating when they are full. How many of us adults can say the same?? Not many, I bet (and I’ll be the first to admit that I am not great at it either!). For many of us, we tend to mindlessly snack out of boredom, loneliness, or stress. We eat to the point where we feel overstuffed, and then we regret our choices. BTW, if this is you, take a look at the principles of mindful eating or intuitive eating, which can help you become more aware of your body’s hunger cues and overcome eating for reasons other than hunger. Responsive feeding means you offer food when baby is hungry, and complete the meal when baby is full. Don’t try and get baby to finish their plate of food, or take more bites when they are full. Even if it looks to you that baby has not eaten enough, it’s important to remember that every meal is different. Your baby may eat a lot for breakfast and very little for lunch or dinner. Or your baby may eat very little on Monday and Tuesday and eat a lot on Wednesday. Look at your baby’s overall pattern of eating for a week, and most of the time you’ll find that, on average, they are eating enough. The more different kinds of food you expose your baby to, the more likely they are to be adventurous eaters when they get older. Most kids will go through some periods of picky eating, but you may be able to lessen the blow. One of the most wonderful gifts you can give your baby is to cook them foods from your family’s background. Let your baby try your mother’s or grandmother’s famous recipes. Expose them to the foods of your culture. Show them that food is exciting and flavorful and fun. You teach your baby about colors, and animals and shapes. Don’t forget to teach them about flavors too! There are lots of baby food jars and pouches available at the grocery store. The quality has definitely gotten better over the years, but these foods really don’t compare to fresh, homemade baby food. Store bought food may contain preservatives, including an acid like lemon juice, which isn’t bad for your baby, but it does affect the flavor of the food. Plus, store bought baby food is expensive, and can cost $1-2 per meal. That doesn’t sound like a lot, but compared to the cost of homemade baby food, it’s expensive! Check out some of my recent articles on making your own homemade baby food. It’s easy, inexpensive, and quick. add water, breastmilk, or formula if you need to make your purée a thinner texture. freeze your purées in ice cube trays, they are the perfect 2 tablespoon serving sizes. Once frozen, transfer to a freezer ziploc bag and label. This will keep in your freezer for 1-2 months. Then simply defrost and heat as many cubes as you need. Mixing and matching fruits and veggies is easy and quick. you won’t need as much purées as you think. Many babies are only eating puréed foods for 2 or 3 months before transitioning to more solid textures and finger foods. When my daughter was starting on purées, I only had to make 7 or 8 ice cube trays of food, and that lasted until she was on to more solid textures. Above all else, remember, you are doing great, even if your kid doesn’t eat kale, açaí, and quinoa. Mealtime is about more than eating, it’s about your baby learning to use all their senses to explore the world of food. Talk to your baby about the food you are eating, let your baby touch and smell the food. Get messy! Don’t forget to claim your free download of this article! Click here.